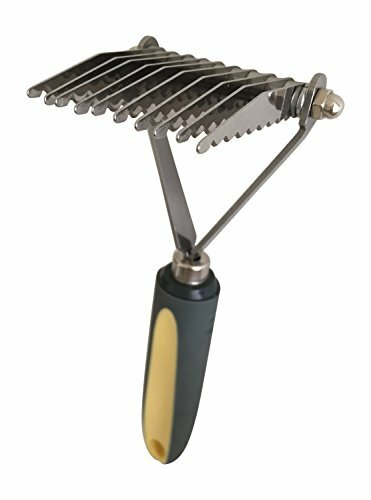 Pixikko 10-Blade De-Matting Tool Comb/Rake for Medium/Long Hair Dogs & Cats by Pixikko at Annie's Dog Spa. MPN: Pix-6478. Hurry! Limited time offer. Offer valid only while supplies last. PIXIKKO PET GROOMING TOOLS ✼ BENEFIT - 1) Increase pet blood circulation. 2) Protect the coat for further growth. 3) Keep the skin surface clean. PIXIKKO PET GROOMING TOOLS ✼ BENEFIT - 1) Increase pet blood circulation. 2) Protect the coat for further growth. 3) Keep the skin surface clean. 4) Promote healthy pet's coat and skin. 5) Reduce hairball. ✼ OFFER - We are constatnly striving to produce the best possible products, and are committed to bring you the best quality products with lowest possible offer price to make you and your furry friends happy! ✼ GUARANTEE - Our Products are carefully tested and quality checked before reaching pet lovers. Please feel free to contact us shoudl you have any conerns or questions. Satisfaction guarantee! 100% 30-day Money back guarantee if for any reason you and your furry friends are not satisfied! ✼ FAVOR - Buy with confidence! You won't be disappointed by clicking the top right hand side corner Orange "Add to Cart" button! MAKE SURE THE SELLER IS PIXIKKO. Products offered by other seller or seller using amazon.com are not our authentic quality products. Pixikko is the only exclusive distributor/seller for our Pixikko Brand. Now you got our grooming tools. Please share your experience with our product how you and your furry friends feel. We would be highly appreciated if you could spare your time to share your product review for other fellow pet lovers : ) ✼ ✼ ✼ ✼ ✼ - PRODUCTS OFFERED BY OTHER SELLER OR SELLER USING AMAZON.COM ARE NOT OUR AUTHENTIC QUALITY PRODUCTS. PIXIKKO IS THE ONLY EXCLUSIVE DISTRIBUTOR/SELLER FOR OUR BRAND. The round tips penetrate into tough mat without hurting pet's skin and the safe wavy-design bottom blades collect loose hair effectively. Ideal for medium to long haired coats. Work effectively even the toughest mat.Non-slip grip handle supports easy grooming. Designed to de-mat and reach beneath the topcoat to remove loose hair and tangles, and to spread natural oils for a shiny healthy look coat. using amazon.com are not our authentic quality products. All of our products are 30-day 100% Money back guarantee if you or your furry friends are not satisfied. If you have any questions about this product by Pixikko, contact us by completing and submitting the form below. If you are looking for a specif part number, please include it with your message.